Combine Word to PDF. Save time, it's easy. You are here: CoolUtils > PDF Combine Pro > Combine Word to PDF. Save time, it's easy. TXT files are editable, anyone can change the information stored in TXT without any problem. If you would like to make a copy of TXT files protected from any changes, you need to convert them to PDF. If you want the program that not only converts TXT to PDF, but also combines a few files to a single PDF document, this is PDF Combine Pro. This utility provides professional functionality in an easy-to-use interface. You will combine several text files to one multi-page PDF document in a few seconds. Just make a few simple actions in the program, and it will produce a correct PDF copy of your TXT sources. The range of settings is similar to all the formats. When you combine TXT to PDF, the program first exports TXT files to PDF and then combines them to a one single document. You can set various parameters for combining, like adding page numbers, creating bookmarks, adding document stamps to header or footer, etc. Using these settings is optional. You can set any of them, and skip the rest to save your time on adjusting the output file format. 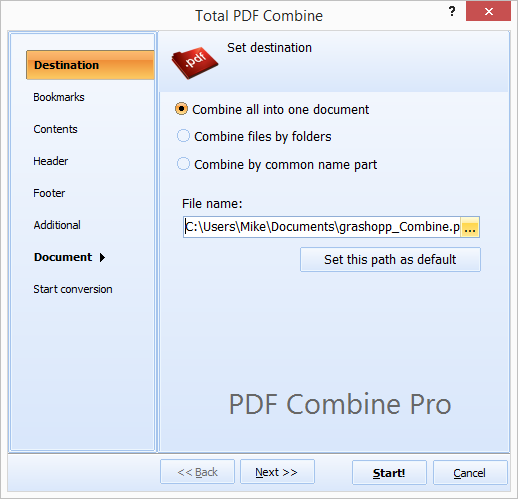 PDF Combine Pro performs both conversion and combining in one step. That is why it does the job twice faster. It works also from the command line, so you can combine text documents to one PDF file not launching the program. When you make settings in the program wizard, there is a button for creating command (bat) file with current settings. Also you can type commands manually. 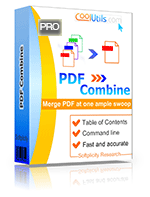 Try PDF Combine Pro right now to see it in action. Download it here.